11. COOK: The program proclaimed the sea level rise won’t be stopped by some Carolina committee’s ignorance of it — but sea level rise will also not rise at the request of the IPCC’s prediction models, and according to a U. of Colorado study, “over the next 88 years, sea level would be expected to rise five inches in North Carolina” in direct contradiction to the Carolina committee’s report. CU sea level data shows no acceleration – quite the opposite. Their whole scary story is based on Hansen’s wildly irrational WAIS collapse theory towards the end of the century. The IPCC estimates only 18-59 cm of sea level rise this century. Apparently CU and PBS do not consider the IPCC to be reputable scientists. The statement which I called into question was this. The PBS article acknowledges that the numbers claimed by Bill Hay are not accurate. Current sea level rise measurements are near the low end of the IPCC range, and are certainly not exceeding the high end. The only long term tide gauge in North Carolina shows even less sea level rise – 2.0 mm/year, and decelerating. There is no evidence that sea level rise is either accelerating or is a serious threat. And does anyone doubt for a second that if the last 20 years of sea level data did show an acceleration certain ‘reputable’ climate scientist would be extrapolating like crazy? In fact, I’ve read lots of peer reviewed papers that do exactly that. More data than 20 years, take 40 or 80 or 100, doesn’t support the claims either. ‘Expected’ acceleration is not equivalent to what has happened or what will happen. We assume ‘X’ will happen therefore ‘X’ is expected to happen. A circular argument if there is ever was one. There is a very high level of self delusion going on here. 97% of respectable climate scientists agree that belief in future catastrophes is necessary to maintain their funding. When the NC CRC “Science Panel” and its half-dozen (all Democrat) invited contributors produced a deeply flawed “assessment report” which projected drastically accelerated sea-level rise for the NC coast, they only examined 24 years of data from one tide gauge, at Duck, NC. 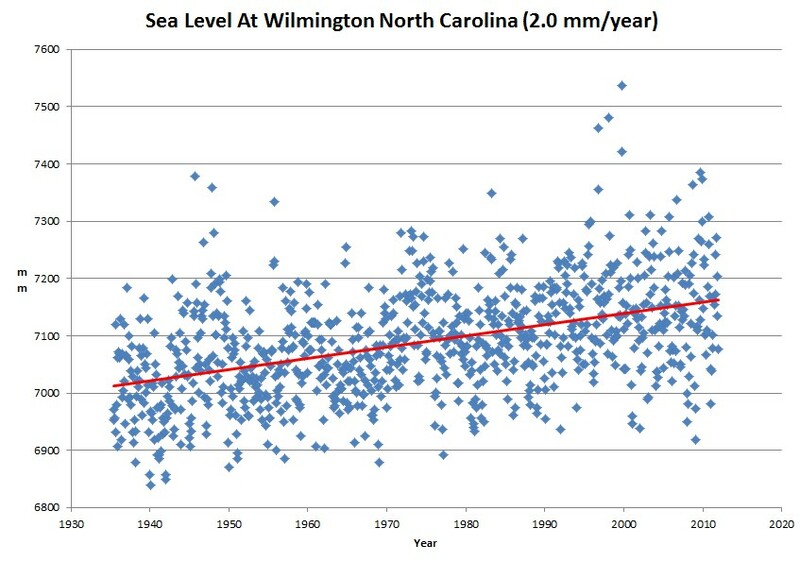 They ignored the vastly superior 75 year continuous sea-level record from Wilmington, even though their own report admitted that at least 50 years of tide-gauge data are needed to determine a robust trend. (Actually, even 50 years is a little on the low side.) The Duck guage is drastically affected by subsidence, which greatly increases the measured rate of sea-level rise there; the Wilmington gauge is only slightly affected by subsidence. So the Duck record looked a bit less ridiculous when grafted onto their graph of Rahmstorf-accelerated sea-level rise than the Wilmington gauge would have. Yeap junk science done by partisans designed to reach a predetermined conclusion. They actually don’t realize how shoddy their side’s work is. They just assume only their own work is dodgy but required to bolster the team. Global warming ceased 16 years ago, as recently reported by the Climate Research Unit. The planet is now experiencing a slight cooling trend (see HADcrut 3, RSS and UAH temperature data), despite rising CO2. So all the alarmist fear-mongering about an impending global warming meltdown is contradicted by observational data. Antarctic ice continues to grow, the Greenland ice cap is not on the verge of meltdown, and glaciers in many regions are growing rather than retreating. So where will the predicted sea level rise come from? Melting sea ice, in the Arctic or anywhere else, doesn’t raise sea levels. The sun (the big planetary weather changer) remains in a very quiet state, with sunspot numbers and solar flux levels during the current solar cycle (SC 24) reminiscent of those experienced during the Dalton Minimum (SC 5), a period of declining global temperatures. If the solar snooze continues into SC 25 (as more than a few solar scientists predict), our planet could be headed for another big freeze. At that point, humankind will be worried about staying warm and feeding itself. Rising sea levels will be the least of its worries as the Northern Hemisphere growing season is cut short and grain belts move hundreds of miles south, reducing agricultural yields and triggering widespread famine. Warm is much better than cold. And CO2 is a plant nutrient that is mankind’s best friend. Pingback: Frontline Responds to complaints about Oct 23 “Climate of Doubt”: Here, the Rebuttal to Frontline that PBS Ombudsman Won’t Put Online | Watts Up With That? If linear extrapolation of a 22 year record 88 years out is unconscionable , how in the world can a non-linear extrapolation be ?